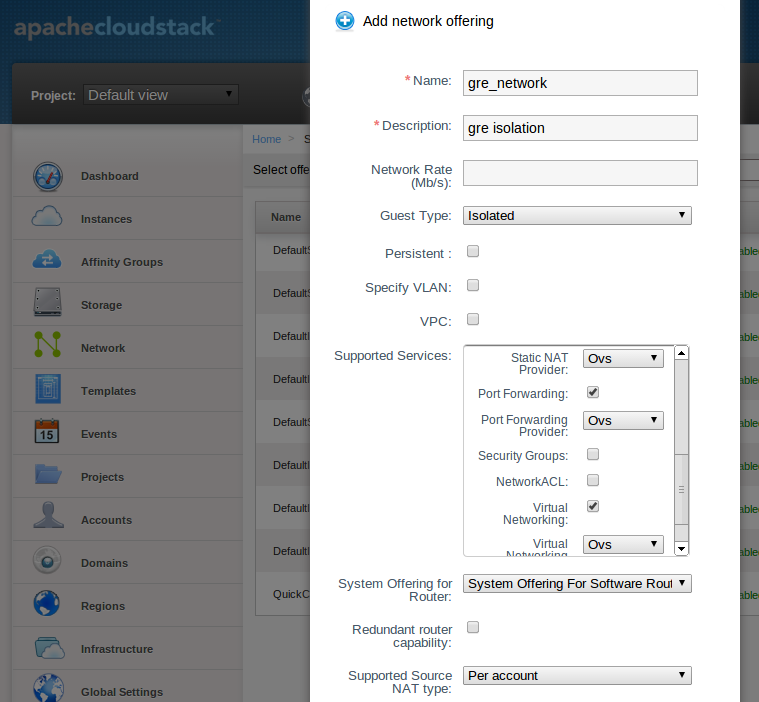 The OVS plugin is the native SDN implementations in CloudStack, using GRE isolation method. The plugin can be used by CloudStack to implement isolated guest networks and to provide additional services like NAT, port forwarding and load balancing. The following table lists the CloudStack network services provided by the OVS Plugin. The following hypervisors are supported by the OVS Plugin. Before enabling the OVS plugin the hypervisor needs to be install OpenvSwitch. Default, XenServer has already installed OpenvSwitch. However, you must install OpenvSwitch manually on KVM. CentOS 6.4 and OpenvSwitch 1.10 are recommended. To make sure that the native bridge module will not interfere with openvSwitch the bridge module should be added to the blacklist. See the modprobe documentation for your distribution on where to find the blacklist. Make sure the module is not loaded either by rebooting or executing rmmod bridge before executing next steps. CloudStack needs to have at least one physical network with the isolation method set to “GRE”. This network should be enabled for the Guest traffic type. Guest & Public traffic: cloudbr1 See KVM networking configuration guide for more detail. The OVS provider is disabled by default. Navigate to the “Network Service Providers” configuration of the physical network with the GRE isolation type. 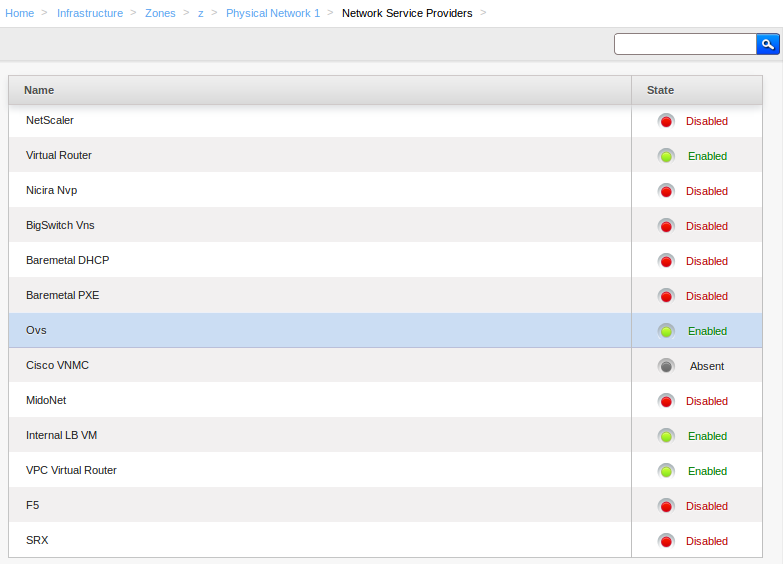 Navigate to the OVS provider and press the “Enable Provider” button. Using the OVS plugin requires a network offering with Virtual Networking enabled and configured to use the OVS element. Typical use cases combine services from the Virtual Router appliance and the OVS plugin. The tag in the network offering should be set to the name of the physical network with the OVS provider.